With an accelerated timeline, Neryn is ready to seek out the four ancient Guardians of Alban to ask for their help in teaching her to become the best Caller she can be, in order to help the Rebel forces (and her friends) of Shadowfell to overthrow King Keldec. But the learning is not easy: Neryn struggles to come to terms with her power and influence, and can’t figure out where her feelings for Flint fit into this greater cause…if they can at all. 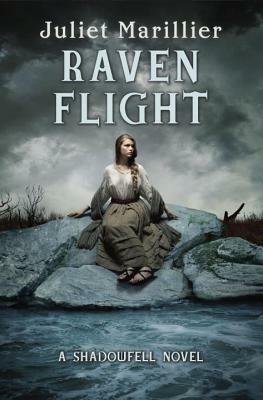 RAVEN FLIGHT was not as engaging for me as Shadowfell—but the thing is, they’re not all that different from one another. Neryn is still this can-do-no-wrong protagonist who, if not liked instantly by all she meets, at least can quickly win them over with her earnest naivete. The plot is straightforward quest involving long distances traveled and new characters met. In RAVEN FLIGHT, we learn more about what exactly makes Keldec so evil. And boy is the man frightening! In one of the most riveting scenes in the story, Neryn is forced to witness Keldec’s cruelties to his subjects from front-row seats. This insight into Keldec’s rule is horrifying, yet really upped the stakes for me as a reader in cheering the painfully perfect Neryn on to success. Unfortunately, perfection gets old, and Neryn’s personality grated on me a lot more in this installment than previously. I think I’m past the age when I can immerse myself in a protagonist who’s flawless—not in that put-together way, but in the one-girl-can-defeat-the-whole-world way. This is a straightforward fantasy geared, I think, more towards readers new to fantasy than to any others. e-galley received for review from publisher and NetGalley. Thank you! So I have long been in awe of Kate Middleton because she has stellar, if upper-class, fashion sense. 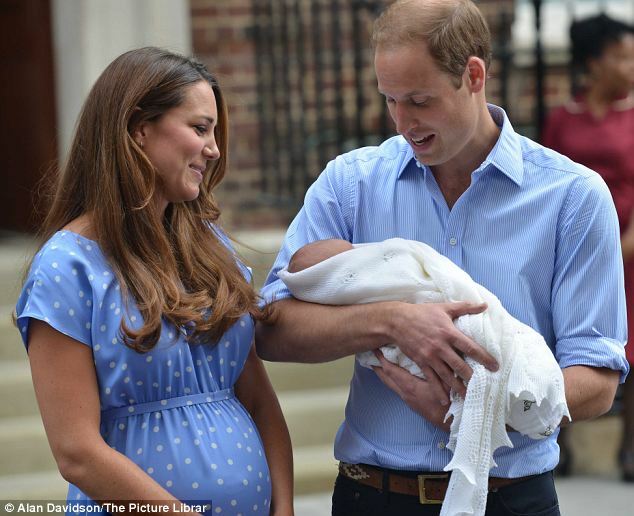 I fully admit to shedding a tear or two when the birth announcement was made, and beaming when watching video of Kate, William, and Baby Cambridge's first appearance together. A lot of online news outlets have already pointed out how wonderful it was that Kate chose that polka-dot dress for the reveal, like she was carrying on Diana's legacy. And I like that (and I love that dress, omigod), but what I loved more was how the dress hugged the shape of her post-baby bump. There is huge pressure in our society for new mothers to immediately get back in shape after giving birth. Crazy supermodels and other Hollywood celebrities constantly show up in the tabloid news cycles sporting perfect bodies mere months after birth. Meanwhile, I can clearly recall being in middle school and watching my mom, a petite woman with biceps bigger than mine, trying to work out the soft pooch at her belly, left over from when she gave birth to my youngest brother...eight years prior. With Hollywoodized images affixed in our minds as what the ideal new mother should look like, I imagine legions of mothers battling self-esteem issues and self-disgust for not looking like those perfect pictures, while their Average-Joe husbands hang out in kitschy sports bars, adding more beer to their rotund bellies and bemoaning why their once-attractive wives have now become dumplings. I have no doubt that Kate Middleton will get back into her old shape in no time, she just seems like that sort of person, but I admire how she was unafraid to pick a dress that showed the parts of post-birth that most celebrities would never dare reveal and, in fact, many of us may have never before seen in the media. Kate will never be a "normal woman," but right now, she's an international face going through normal-woman parts of life, and I think she made such a brave and role-model-worthy decision to show us the beautiful truth about post-partum women's bodies. Debut author Kelsey Sutton took a big risk in deciding to write about a protagonist who can’t feel any emotions. After all, one of the biggest criticisms of unsuccessful YA is about bland characters. And while there is an external reason for why Elizabeth is like a shell of a person, I am sorry to say that, instead of being a bold experiment in defying common YA problems by facing them head on, SOME QUIET PLACE merely fell into those very traps. I’ll be straight with you: Elizabeth has no personality. And it’s not just her being her usual emotionless. She literally doesn’t have anything that distinguishes her from a blank slate other than what’s imposed on her from the outside. When describing Elizabeth, one has to resort to external descriptors: she has rotten parents, an absent brother, she likes to paint. This doesn’t tell us ANYTHING about Elizabeth. People need not be defined by the abuse of their families nor the fact that she paints with all the investment of one doing the dishes. Even sociopaths, who medically do not feel empathy, can have personalities. Elizabeth doesn’t, and that’s not a symptom of her problem. The lack of personality is not just limited to the MC. Side characters are flat with (again) no personality of their own. Elizabeth’s father is the cardboard drunk and abusive character, while Elizabeth’s mother is the repressed and resentful housewife. Elizabeth’s best friend is the dying girl scared of dying. These are tropes, not to be confused with characteristics. With personality. SOME QUIET PLACE furthermore falls into common YA pitfalls regarding its plot and mystery. Like too many other YAs that describe themselves as mysteries, SOME QUIET PLACE’s unfolding of its mystery is stuttering and unsatisfying. A great mystery reveals just enough hints in unexpected yet narratively consistent intervals to keep readers ensnared and invested. The “mystery” in this book—of what in Elizabeth’s past caused her to be the way she is—remains a mystery until its sudden anticlimax. The purported “hints” dropped throughout the book are not, actually, hints. “Hints” implies relevance to the plot and mystery; it’s not supposed to be a foray into a dull miniadventure leading into a dead end that the book insists to be a hint, but is in fact just pacing weakness, Insert Dramatic Red Herring Here. The so-called suspense in this book, unfortunately, was so unsatisfying as to frustrate me into apathy. I could write more, but I’ll stop there and say this: It is completely possible to write from the point of view of a person who can’t feel emotions. 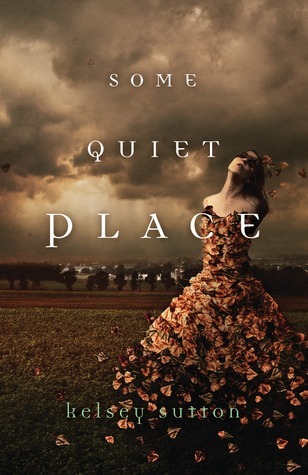 But SOME QUIET PLACE was an amateur’s attempt, and sadly it wasn’t long before I realized that I could not feel anything towards Elizabeth and her predicament. And it’s not because I can’t feel emotions. Cover discussion: Isn't it luscious? I can practically feel the texture of that dress. Scarlet Benoit’s grandmother has gone missing. Everyone tells her to not worry about it, there’s nothing she can do, her grandmother is an individualistic kind of person, but Scarlet thinks there’s something more insidious behind her grandmother’s disappearance. The only person who will help her is a soft-spoken street fighter named Wolf, whom Scarlet hopes she can trust, but who may have an agenda of his own. Answers are discovered, but more questions raised, when they cross paths with Cinder, whose recent and widely publicized escape from a New Beijing prison just might start the war that the ruthless Lunar Queen has been waiting for. Cinder was my unexpected enjoyable find of last year. 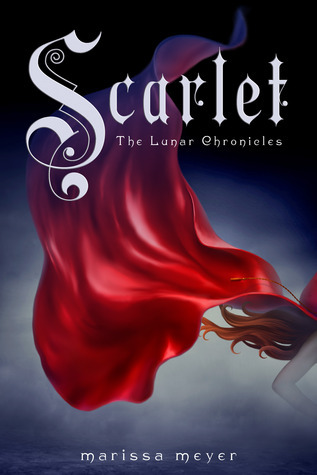 After experiencing how effortlessly Marissa Meyer can weave together a convoluted yet exciting tale, I had high demands for the sequel, SCARLET. And in a way, SCARLET fulfilled them. In a way, it didn’t. The good first: everything we liked about Cinder is in here, except perhaps even a notch better. In particular, the characters, old and new, major and supporting, are easy to cheer on. I mean, there are exceptions. Kai’s role is reduced to that of beleaguered new and helpless emperor under international pressure. Wolf, I’m sorry to say, did not appeal to me so much, not because I didn’t like his soft and shy personality (I did) so much as I have known many misunderstood love interests with wounded hearts of gold (see: many adult romance male leads). But when you weigh the slightly annoying—Kai and Wolf—against the good—Cinder’s resourcefulness and empathic internal struggle, Scarlet’s ferocity at protecting her loved ones, Thorne’s much-appreciated airheaded charm lightening the mood)—the good comes out on top. That being said, one of the issues that some reviewers noted as a weakness in Cinder is even more apparent in SCARLET, and that is the world-building. I remember thinking the world-building in Cinder was decent, but in SCARLET I found it lacking. Don’t get me wrong: Meyer does a Richelle Mead-worthy job of setting up an elaborate yet believable backstory to the world’s current state, the one involving the Lunars and Princess Selene. But settings-wise, inadequate research and/or thought was glaringly apparent. At no point did the scenes in France distinguish themselves from what could’ve been going on in any other place in a future Earth. I wanted the book to show me its vision of what a future Earth divided into regions like the Eastern Commonwealth and European Federation, and experiencing strained relationships with Lunar, would look, feel, hear, taste, and smell like. What distinguishes Rieux, Scarlet’s hometown, from other places in the world? How does Paris fare several centuries from now, and how does its altered cityscape affect the characters’ movements and experiences? Still, SCARLET was fast-paced and exciting. My attention started wavering around the end when everyone was running around killing each other in a very blankly drawn future Paris, but I’m still curious enough about how the Lunar/Princess Selene conflict will play out that I think I’ll continue to hang around this series. Read at the surface level, SCARLET is a successful rollicking good read. But I hope the series will pick up a bit on its world-building, for fear that those cracks will end up pulling the books down. Cover discussion: Oh hey, look, a publisher that didn't feel compelled to arbitrarily change the cover from hardcover to paperback. Hooray! I do like how this cover matches the one for Cinder, which I felt was memorable and powerful in its simplicity.